Jordan had three tackles (all solo) in Sunday's divisional-round playoff win over the Eagles. 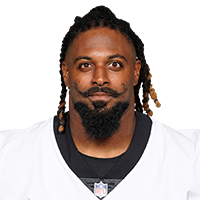 Jordan had four tackles (four solo), two sacks and one pass defensed in the Saints' win over the Buccaneers on Sunday. Analysis: It was the third consecutive game Jordan has been able to rack up two sacks, which brings his season sack total to 12. Jordan and the Saints will take on Carolina in Week 15. Jordan had seven tackles (three solo), two sacks, a forced fumble and a fumble recovery in Thursday's loss against the Cowboys. Analysis: Jordan was all over the place as he played all but five defensive snaps. He came up with a key strip-sack and fumble recovery late in the fourth quarter, though the Saints were unable to convert it into points. The 29-year-old has 10 sacks for the season and two sacks apiece in each of the past two games. Jordan recorded four tackles (all solo) and two sacks during Thursday's 31-17 win over the Falcons. Analysis: Jordan recorded his eighth sack of the season Thanksgiving Day, and he also logged his highest single-game tackle total since Week 3. The veteran's lack of consistent weekly tackles makes him difficult to trust in IDP formats, but he does possess some value due to his ability to reach the quarterback. He'll face a tough matchup against the Cowboys' offensive line Week 13. Jordan recorded one tackle for loss during Sunday's 48-7 win over the Eagles. Analysis: Though Jordan's lone tackle went for an eight-yard loss Sunday, he failed to otherwise make an impact in a game that was virtually over before it started.. Because he doesn't rack up significant tackle numbers, Jordan's only real IDP value comes from his ability to get to the quarterback, though he has just one sack over his past five games. Jordan had one tackle -- a sack -- in Sunday's win against the Bengals. Analysis: With only 25 tackles through nine games, Jordan is well off the 62-tackle pace he set as an All-Pro last season. Still, with six sacks and three pass defenses, Jordan remains a valuable contributor in IDP leagues. Jordan made two tackles in Sunday's win against the Ravens. Analysis: Baltimore boasts one of the better offensive lines in the league, and Jordan was unable to add to his team-high five sacks. Still, the All-Pro defensive end has recorded at least two tackles in every game this season and remains a solid option in most IDP leagues due to his ability to provide versatile weekly production. Jordan had two tackles and a sack in Monday night's 43-19 win over the Redskins. Analysis: Jordan now has five sacks on the year, the third-highest figure in the NFL. The defensive end won't pile up the tackle totals, but his ability to get to the quarterback makes him a worthy play in IDP formats. Jordan (biceps) practiced fully Thursday, the Saints' official site reports. Analysis: Jordan has been an iron man in seven-plus years in the NFL, missing no games while racking up at least 900 defensive snaps in five of the previous six seasons. The usage has allowed him to reach double-digit sacks in three seasons, and he's well on pace to do it a fourth time in 2018 after recording four sacks through three outings. Jordan was a limited practice participant Wednesday due to a biceps injury, Luke Johnson of The New Orleans Times-Picayune reports. Analysis: With two takedowns of Matt Ryan in Week 3, Jordan put himself firmly into the top spot in the NFL with four sacks, tied with the likes of Von Miller, Khalil Mack and Myles Garrett. As one of the league's premier pass rushers, Jordan boasts double-digit sacks in three of the previous five campaigns. Considering he hasn't missed a game in his seven-plus years as a pro, he should be able to brush off the current concern and suit up for Sunday's road game against the Giants. Jordan posted five tackles (four solo), including two sacks, and a pass defensed in Sunday's win over the Falcons. Analysis: Jordan has now posted multiple sacks two weeks in a row. He's already taken down the quarterback on four occasions overall and has looked the part of a top IDP option. He'll look to take advantage of a struggling Giants offensive line in Week 4. Jordan racked up two tackles, both sacks, in Sunday's 21-18 win over Cleveland. Analysis: Jordan's tackle total dipped from Week 1 to Week 2, but he more than made up for it by securing a pair of takedowns on Browns quarterback Tyrod Taylor. Jordan's ability to pressure Matt Ryan in Week 3 could play a big role in the defense's effort to stymie the Falcons' offense as the Saints look to move to 2-1 on the season. Jordan had six tackles (three solo) and a pass defensed in Sunday's loss to the Buccaneers. Analysis: Jordan failed to record a sack after notching a career-high 13 last year, but he batted down a pass -- something he did on a regular basis in 2017 -- and recorded a solid six tackles in the opener. Jordan was a first-team All Pro in 2017 and is expected to once again serve as an excellent IDP option in many fantasy leagues. Jordan (foot) has been medically cleared for the start of the Saints' training camp, which begins Thursday, Joel A. Erickson of The Baton Rouge Advocate reports. Analysis: Jordan is looking to extend his consecutive appearances streak since he was selected in the first round of the 2011 draft. Currently sitting at 112 games, he appears good to go following February surgery to remove a bone spur from his left foot. Assuming he remains healthy yet again in 2018, Jordan will aim to secure his fourth double-digit sack campaign in six seasons. Jordan (foot) was sidelined for team drills during OTAs on Thursday, Josh Katzenstein of The New Orleans Times-Picayune reports. Analysis: It's unclear exactly how much individual work Jordan may have been able to put in Thursday, but it looks like the Saints are easing the defensive end back onto the field after he underwent minor foot surgery back in February. There hasn't been much concern surrounding Jordan's health since the surgery, however, and there isn't much of a reason to rush him back onto the practice field. Expect another update on Jordan's status to come during the team's mandatory minicamp in June. Jordan (foot) is no longer wearing any protective equipment on his surgically-repaired left foot, Joel Erickson of the New Orleans Advocate reports. Analysis: Jordan underwent offseason surgery to remove a bone spur in his left foot. While this is an injury that has reportedly bothered Jordan for the better part of two years now, the corrective procedure he recently underwent is still considered to be a minor operation. 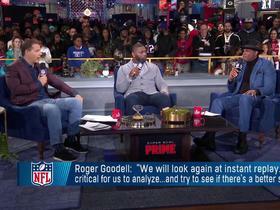 The 2017 first-team All-Pro should be back to normal well in advance of training camp and could possibly take part in offseason workouts as well. Jordan recently underwent minor surgery on his left foot, Josh Katzenstein of the New Orleans Times-Picayune reports. Analysis: Jordan, who currently requires a protective boot and scooter to move around, reportedly underwent a voluntary procedure that had more to do with "pain tolerance" than anything else. The fact that he played in the Pro Bowl prior to undergoing surgery suggests the situation truly is minor in nature. The 2017 All-Pro defensive end is expected to be recovered within 4-6 weeks and should therefore be healthy in time for the Saints' offseason program this spring. Jordan posted one tackle in Sunday's 29-24 divisional-round loss to the Vikings. Jordan had three tackles (two solo), a sack and two passes defensed in Sunday's 31-26 NFC wild-card victory over the Panthers. Analysis: Jordan's well-rounded stat line was indicative of the huge effect he had on the game, as the defensive end constantly disrupted Carolina's offense with his strong pass rush. Jordan was named a first-team All-Pro by the Associated Press for the first time in his seven-year career, and the versatile defender should be a must-start IDP option against the Vikings in next week's NFC divisional-round showdown. Jordan had four tackles and a sack in Sunday's loss to the Buccaneers. Analysis: Jordan capped his incredible season with another sack in the regular-season finale in Tampa. With 62 total tackles, 11 pass defenses and 13 sacks, the Pro Bowl defense end will look to continue to stuff the stat sheet next Sunday when the Saints host the Panthers in the first round of the playoffs. Jordan recorded three tackles (all solo) and two sacks in Sunday's 23-13 win over the Falcons. Analysis: Jordan ended a three-game drought without a sack, and was the only defensive lineman from either team to play every defensive snap. Sunday's performance brings the 28-year-old's season sack total to 12, tied for fifth in the NFL. Jordan had just one tackle but he deflected four passes in Sunday's 31-19 win against the Jets. Jordan had two tackles (both solo) in Thursday night's 20-17 loss to the Falcons. Analysis: It was a quiet game for the Saints' Pro Bowl defensive end, which shouldn't necessarily come as a surprise against a good Atlanta offensive line. Still, Jordan managed three quarterback hits and was awfully close to sacking Matt Ryan on a number of occasions. Facing a Jets offense that has allowed opponents to sack Josh McCown 35 times this year, Jordan could be in for a nice bounce-back performance in Week 15. Jordan had six tackles (five solo) in Sunday's win against the Panthers. Analysis: Jordan couldn't sack Panthers quarterback Cam Newton but his six total tackles led the Saints. New Orleans' Week 14 opponent, Atlanta, has given up only 16 sacks all season, but the star defensive end continues to be a must-start in many IDP leagues due to his ability to rack up both sacks and consistent tackle totals. Jordan had four tackles, including two sacks, in Sunday's 26-20 loss to the Rams. He also batted down a pair of passes. Analysis: In a game in which the Saints defense struggled without its two starting cornerbacks, Jordan still impressed. The star defensive end is now up to 46 total tackles and 10 sacks on the year. Jordan is well on his way to another Pro Bowl and should continue to be a high-end starting defensive lineman in IDP leagues. Jordan had four tackles (all solo) and a sack in Sunday's 34-31 win against the Redskins. Analysis: Jordan upped his sack total to eight on the season, to go with 42 tackles. His ability to rack up sacks while maintaining a solid tackle floor makes Jordan one of the best IDP options along the defensive line. At this stage of the season, the dominant defensive end's play speaks for itself, and fantasy owners should continue to deploy Jordan with confidence. Jordan (back) was a limited participant in practice Friday, but was omitted from the Saints' injury report ahead of Sunday's game against the Redskins, JP Finlay of NBC Sports Washington reports. Analysis: The lack of a full practice this week apparently won't impact Jordan's availability for the Week 11 matchup, so it's presumed that he'll take on a normal workload. 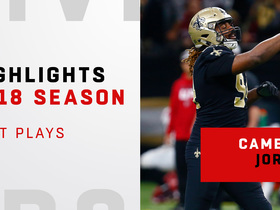 The pass-rushing presence of Jordan, who has notched seven sacks to go with 38 tackles in nine games, has been beneficial for a New Orleans secondary whose dominance this season has keyed the Saints' hot start to the season. Jordan (back) was limited in practice Thursday. Analysis: After logging a full practice Wednesday, Jordan suddenly appeared on the injury report Thursday, which may be a cause for concern. Details on the injury remain relatively unknown, but look for more updates to come once Friday's injury report is released. If he is ruled out or sees restricted snaps, expect Trey Hendrickson to see increased action. Jordan had seven tackles (five solo) and 1.5 sacks in Sunday's 30-10 win against the Buccaneers. Analysis: Jordan has ranked as one of the top edge defenders all year and he continued his excellent season Sunday. His 38 total tackles rank fourth among NFL defensive linemen, while his seven sacks are the 10th most among all defenders. The former Pro Bowler is in his prime at 28 years of age and is playing some of the best football of his career. IDP owners should continue to deploy him with confidence. 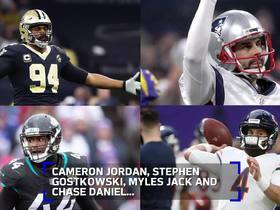 New Orleans Saints defensive end Cameron Jordan joined New England Patriots kicker Stephen Gostkowski, Jacksonville Jaguars linebacker Myles Jack and Chicago Bears quarterback Chase Daniel on the 2019 USO Tour of South Korea. 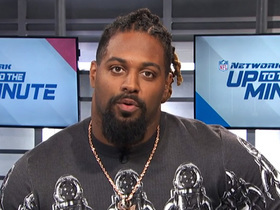 New Orleans Saints defensive end Cam Jordan breaks down the New Orleans Saints' 2019 schedule. 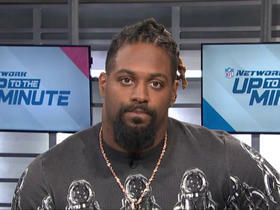 New Orleans Saints defensive end Cam Jordan joins "Up to the Minute" and reacts to the new reviewable pass interference rule. 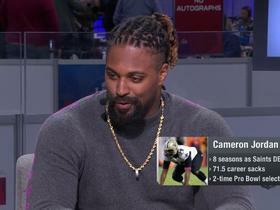 New Orleans Saints defensive end Cameron Jordan joins "Super Bowl Prime". 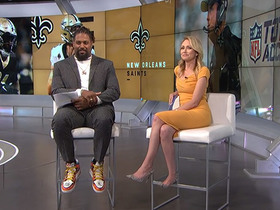 New Orleans Saints defensive end Cameron Jordan joins "NFL Playbook" ahead of Super Bowl LIII. 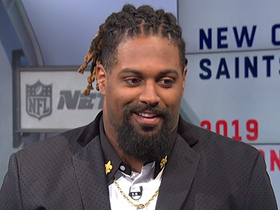 Watch New Orleans Saints defensive end Cameron Jordan's best plays in the 2018 season. 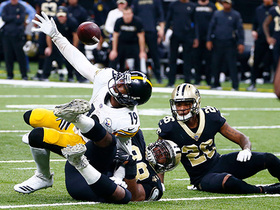 The New Orleans Saints recover Pittsburgh Steelers wide receiver JuJu Smith-Schuster's fumble to seal a win. 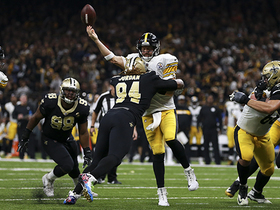 New Orleans Saints defensive end Cameron Jordan helps force an incompletion by Pittsburgh Steelers quarterback Ben Roethlisberger.